Who is in control of the day session for stocks: buyers or sellers? A straightforward way to assess this is to track the NYSE TICK ($TICK), which continually updates the number of stocks trading on upticks versus downticks. If we see broad buying, we'll see very high (+800 or greater) TICK numbers. Broad selling gives us readings of -800 or lower. 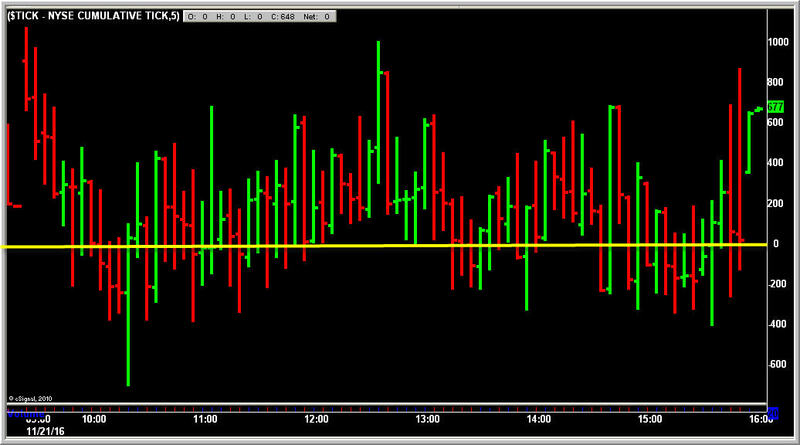 Above we can see the five minute TICK readings for yesterday's trading session. 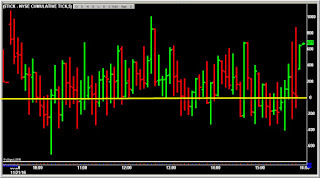 Note that we opened with significant buying interest and stayed above the neutral zero (yellow) line for most of the trading session. Most important, we never saw selling readings of -800 or less. Quite simply, many more stocks traded on upticks than downticks over time, not so much because upticks were extremely high as because we had a relative absence of selling pressure. That absence of sellers was a great tell that prices would remain firm through the session. By watching the distribution of TICK readings--and shifts in that distribution--through the trading day, we can become sensitive to demand/supply changes that typically occur at market turns. When the distribution is one-sided, recognition of that fact can keep us out of bad trades.